Armed with clipboards and winning smiles, a group of Lambeth officers have been conducting an unusual neighbourhood boundary mapping exercise in West Norwood. The exercise is part of a larger project led by Lambeth First, the local strategic partnership, which aims to find out how local public sector agencies can give more control to the local community over services in the area. The first part of this project involves asking local people what they perceive to be the boundaries of their neighbourhood and understanding what they define as their community – in this case, what the borders of the West Norwood area are. We based our boundary mapping methodology on the work of Euan Mills who carried out the exercise in Dalston. First step in the mapping process involved drawing up a rough set of boundaries for West Norwood based on one of our team members’ knowledge of the area (please see the map below). 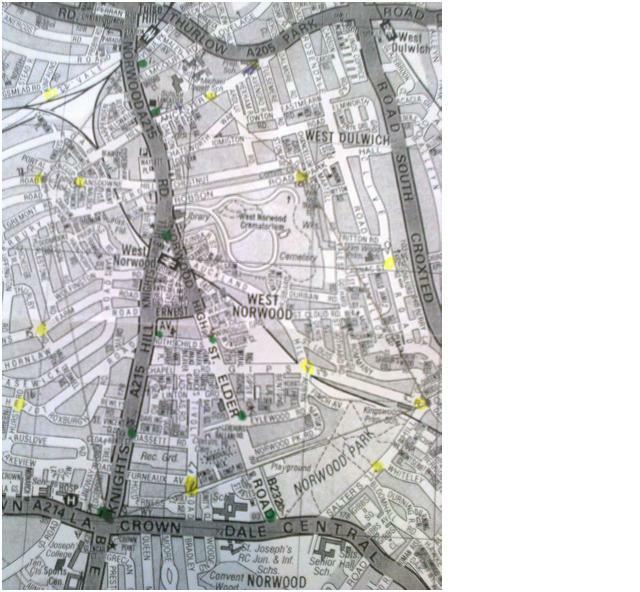 We then identified 22 points (highlighted with green and yellow dots) along the boundary lines that we would test to see whether local people think they fall within West Norwood or not. Working in pairs, we stationed ourselves at each of the 22 ‘test points’ and asked 10 passers-by ‘Excuse me, what area is this?’. It turns out that for many people in West Norwood, this is quite an interesting question. Sometimes the answer was a resounding ‘West Norwood, of course’ from the majority of respondents. At other ‘test points’, the response required much more consideration: ‘Well, up the road is West Norwood, but just under the bridge in the other direction is Tulse Hill, so I’m not exactly sure what area this spot falls under…’, ‘It depends whether you are buying or selling a house in this area’. The answers both confirmed and challenged our preconceptions about what the area of West Norwood is, and we are still working on analysing the results of this mini survey. So far we have learnt that, whilst there might be a core area that local people agree is West Norwood, neighbourhood boundaries will tend to be fuzzy and people’s perceptions of them can depend on multiple factors, not necessarily related to what the London A-Z identifies as an particular area. When the analysis is complete we will publish the resulting map on the toolkit for further comment and (no doubt) lively debate! The Mutuals Information Service has been set up by the Cabinet Office to offer information and resources to anyone interested in setting up a public service mutual, or who wants to learn more about this area. The website has information about the key steps towards becoming a mutual, case studies, and perhaps most usefully, information on how to access the Mutuals Support Programme. This free service is designed to help promising mutuals develop by providing the professional expertise and advice they do not have access to and can’t fund themselves. It will focus on the ‘pre-spin out’ phase, where access to finance can be particularly restricted, but will also consider supporting existing spin out public service mutuals. 2) Referrals which meet the criteria (available on the website) will go the Mutuals Support Programme Approvals Board in the Cabinet Office. The presentations which are attached below give more information on the kinds of support that will be offered by the Cabinet Office. There is also a presentation that was delivered by the National Council of Voluntary Organisations (NCVO) this highlights some of the views that they have captured from the voluntary sector about public sector reforms.